The Seven Labors of Rostam or Haft-Khan-e-Rostam are a series of acts carried out by the greatest Persian hero Rostam. 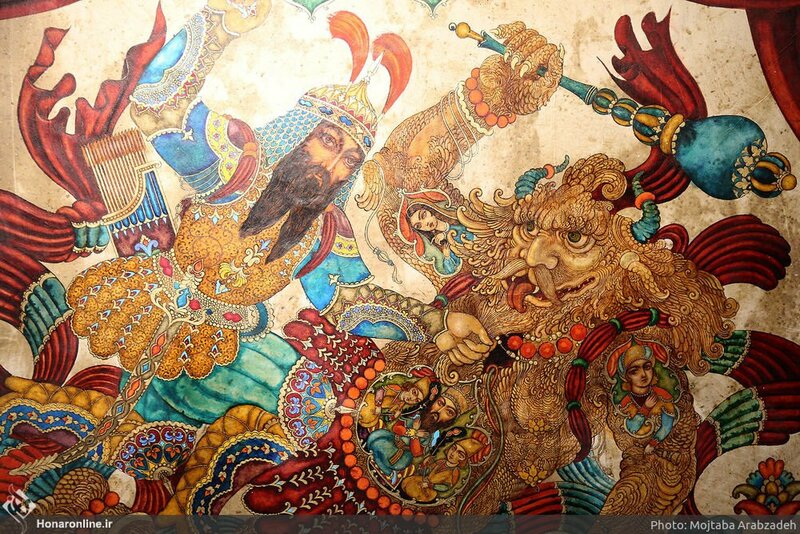 The story of Haftkhan was retold by Ferdowsi in his epic poem, the Shahnameh or Book of Kings. The Seven Labours of Rostam are the names of the seven battles in Ferdowsi’s Shahnameh, which Rostam son of Zal and Esfandiar son of Goshtasb fought. 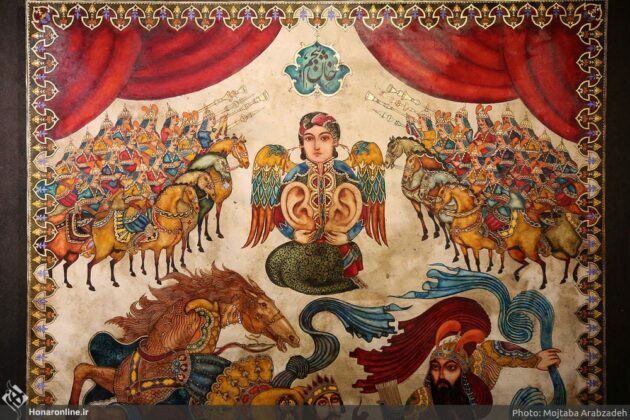 These were the battles that Rostam led to save Keykavous, the Shah of Iran, who was captured by a white demon. According to the traditional narrative, the story starts when Keykavous’ expedition to Mazandaran fails, and the army are captured by the Deevs led by the white demon. 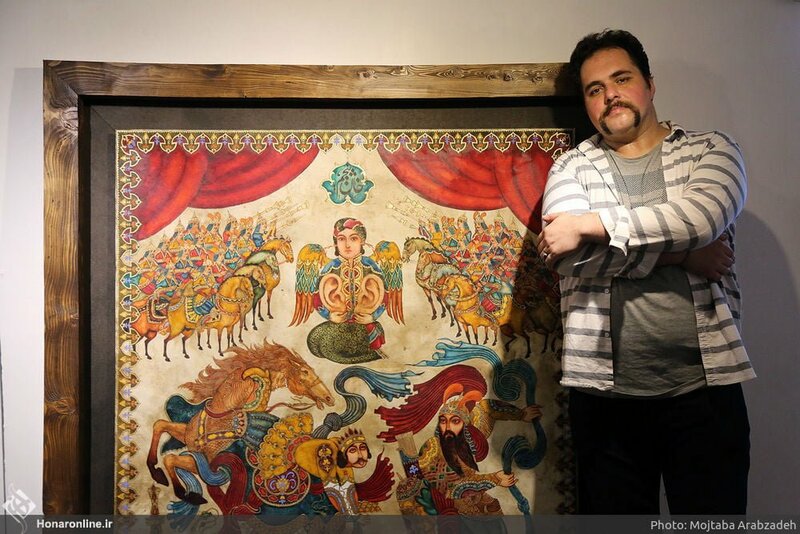 Khazaei has put on display seven paintings of the story with different techniques. Each painting represents one of the Labours of Rostam. “I worked on Shahnameh for this exhibition because this book has a great visual potentisl and a lot of work can be done on it. I had read the Shahnameh many times and was influenced by it. 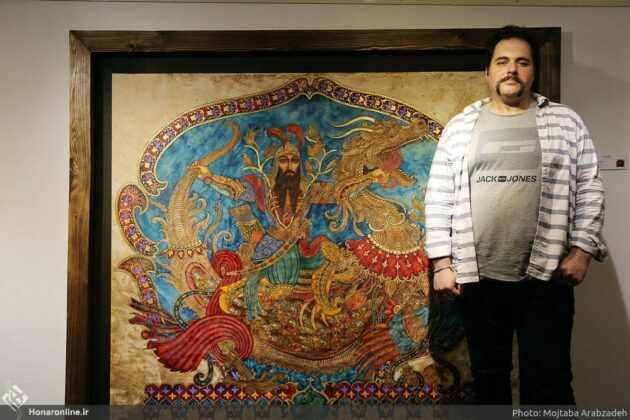 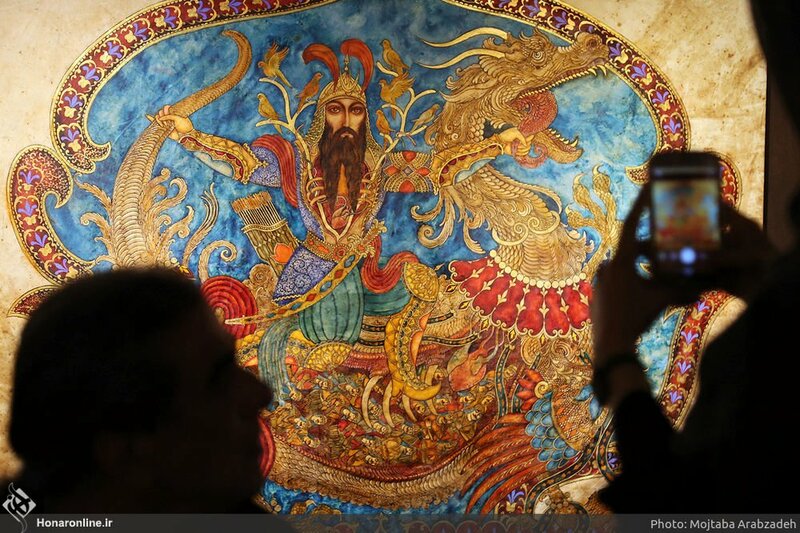 Of course, I tried to involve my personal narrative in the stories, and I did not simply focus on the exact story of Shahnameh,” said Khazaei in an interview with Honar Online. 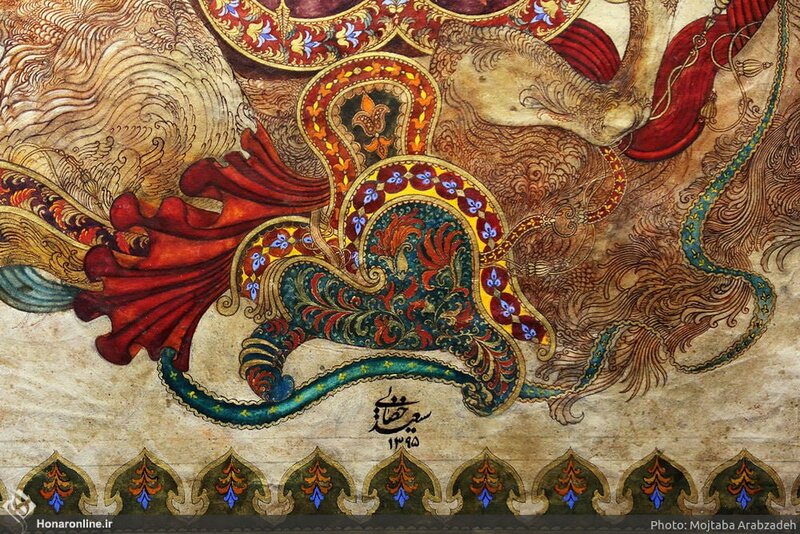 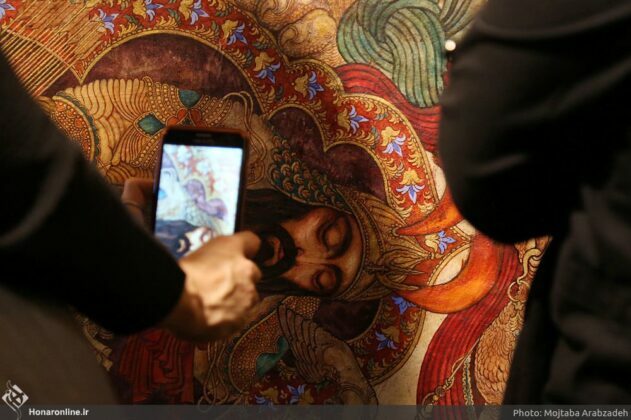 “Iranian painting is like a visual treasure. It is so rich that can be compared with modern works. 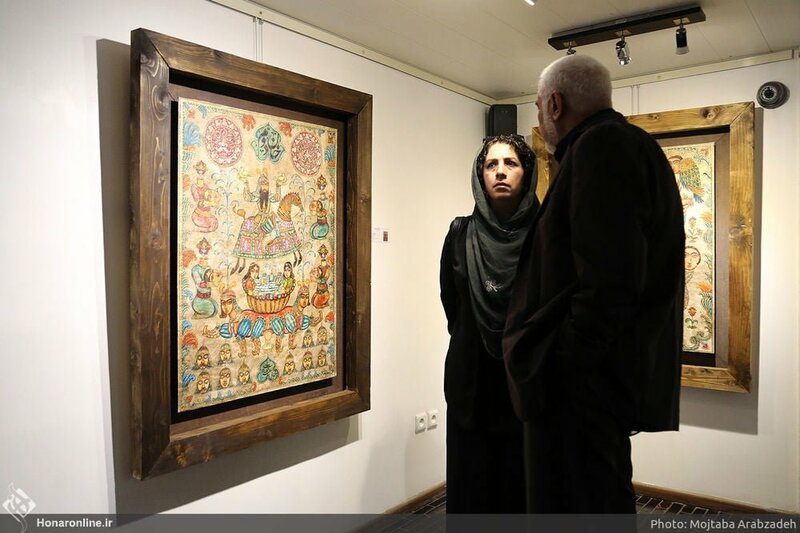 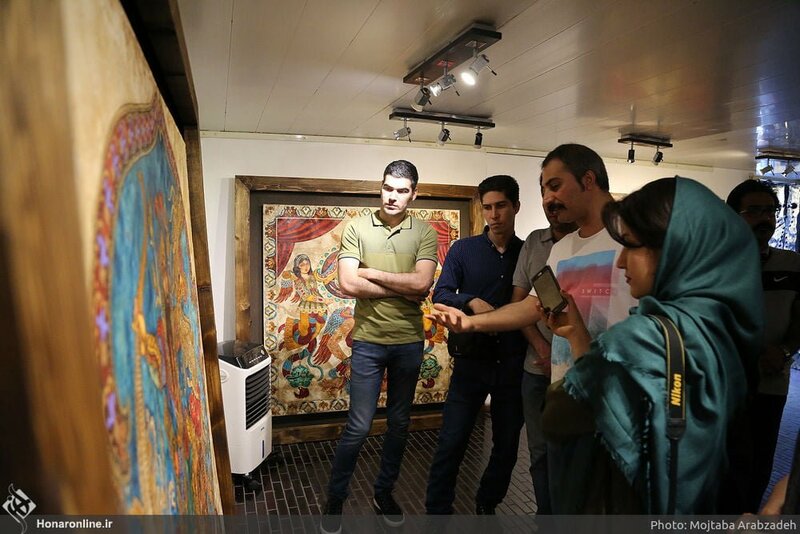 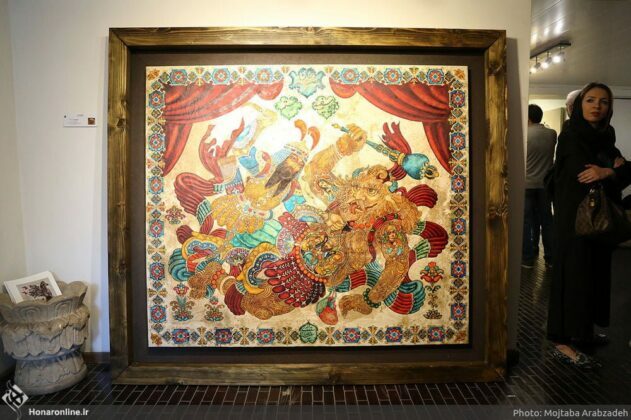 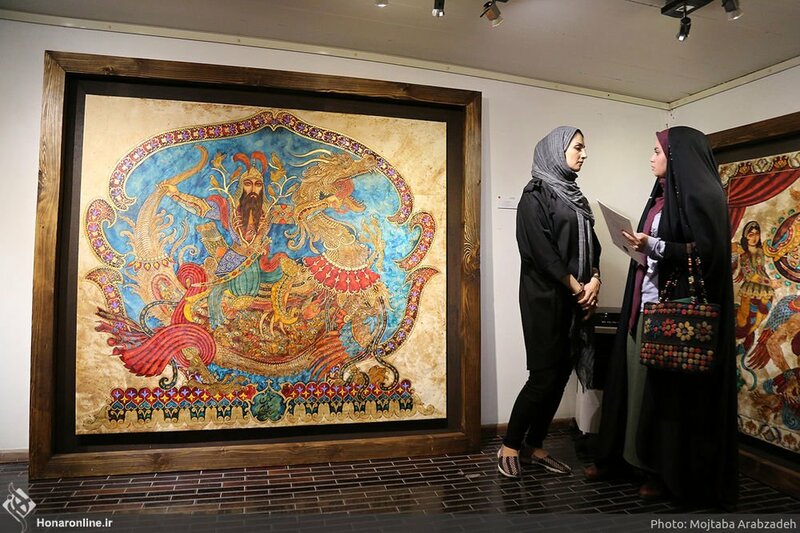 Characterization, spatialisation, composition, and colour combination of the Iranian paintings are the same as the abstract or modern art works,” added Khazaei. 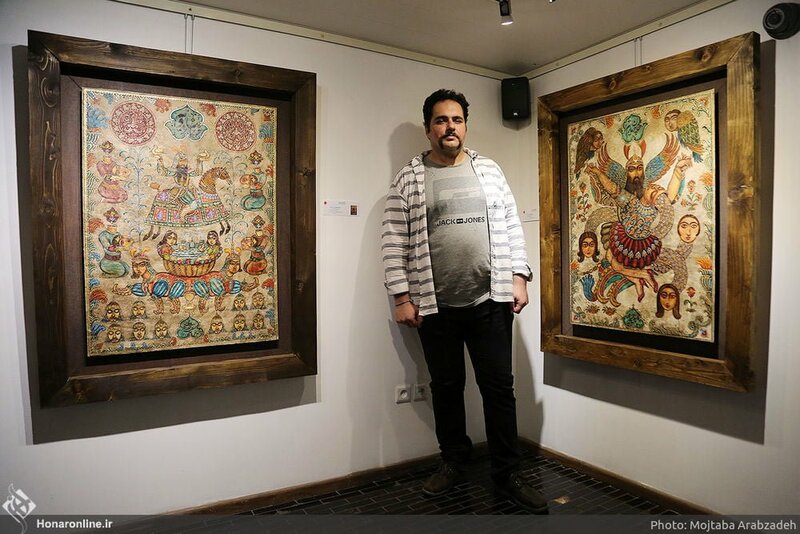 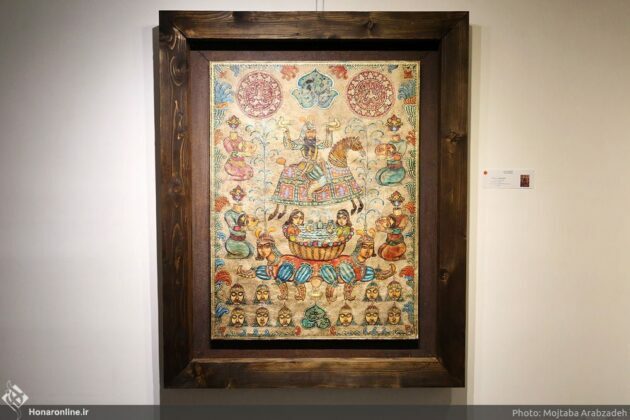 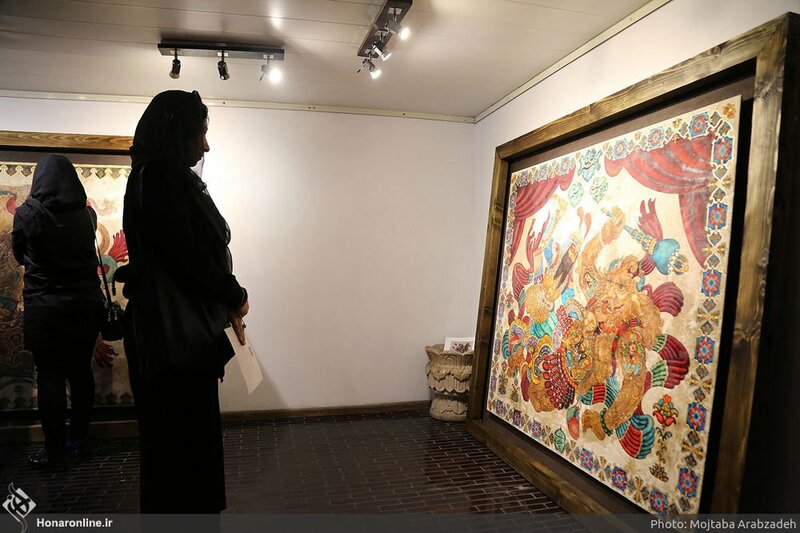 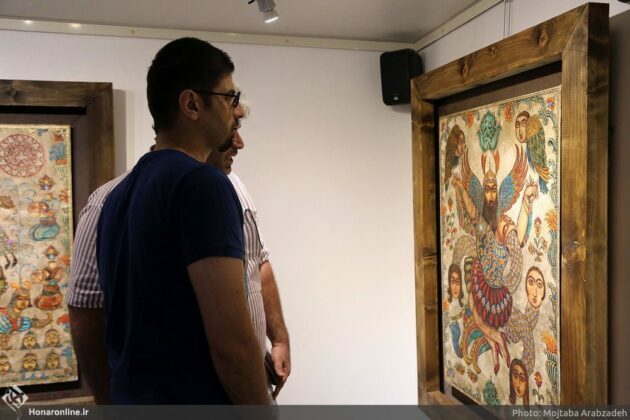 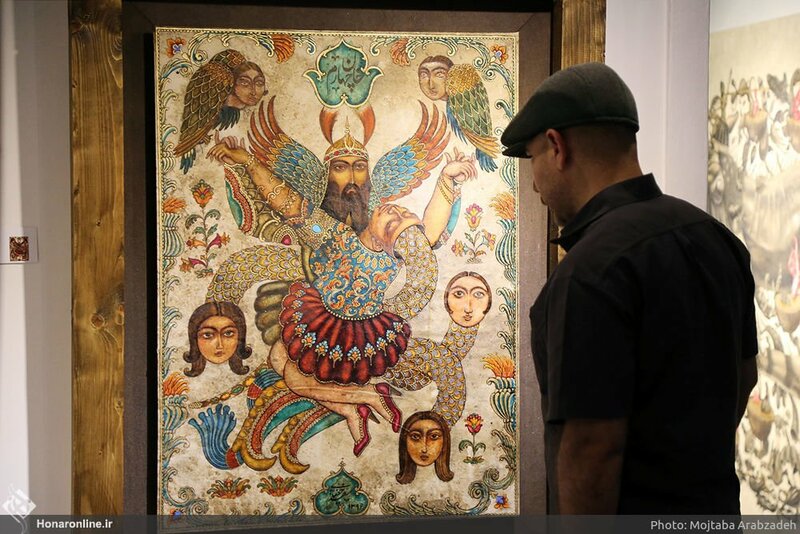 Exhibition of the paintings by Khazaee titled “The Seven Labours of Rostam” was underway until June 20th in Tehran’s Seyhoun Art Gallery.